Accelerate your time to market with Atmosphere’s low-code IoT development platform. Atmosphere is a robust, integrated and highly scalable platform that gives IoT developers what they need to build, connect and manage embedded-to-cloud solutions. With Atmosphere, you don’t need to struggle integrating untested components from multiple vendors and places. Get started prototyping today and fast track your development cycle from concept through deployment. Atmosphere provides a full suite of pre-integrated IoT building blocks to help you build, connect, and manage your IoT solution. Rapidly create projects though Atmosphere’s unique drag-and-drop elements, blocks of pre-made code that perform a variety of functions, from reading embedded sensors to sending commands from the cloud directly to your device. Connect elements together and bring your ideas closer to market. Build entire projects from start to finish without code using Atmosphere’s drag-and-drop elements to generate project code for you, adding the functionality you want in a fraction of the time. Create rich graphical interfaces for your devices that bring your IoT concepts to life through easy designing of mobile apps and web-based user interfaces. Integrate dozens of sensors from the top semiconductor manufacturers in Atmosphere’s library of embedded sensors to create an endless variety of IoT applications. Atmosphere integrates connectivity to our cloud seamlessly for every project, enabling you to provision and communicate with your devices securely and reliably. With the click of a button devices are provisioned to Atmosphere, so you don’t need to struggle using complicated embedded SDKs or poorly-written documentation to do it yourself. Use safe and secure authentication mechanisms, including single sign-on via SAML, two-factor authentication, or Google OAuth. Your solution may require a variety of connectivity protocols from the edge to the cloud and between. Atmosphere supports many common protocols, including Wi-Fi, Sigfox, LoRa, NFC, and cellular. Monitor and manage your devices, data, and users with visual dashboards, analytics,and notifications—anytime and anywhere. 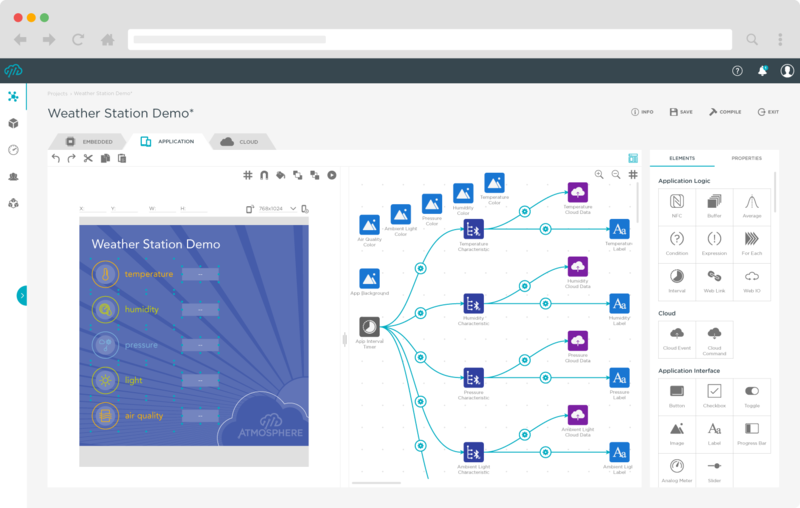 Monitor, analyze, and make smarter, data-driven decisions using Atmosphere’s configurable visual dashboards and reporting options. Manage your entire deployment from one location. Oversee a fleet of devices, users, services, and more as you manage their operation, settings, and permissions. Push firmware updates securely over the air across your entire network of devices, and seamlessly deploy mobile app redesigns on the fly that update and work instantly. Choosing the right building blocks is a tough decision. We make it easier by offering the best to get started. Get started building today and fast track your development cycle from concept through deployment.